What Did the ASEAN Trilateral Terror Meeting Achieve? The Philippines, Indonesia, and Malaysia are trying to forge a collective approach to counter terrorism. 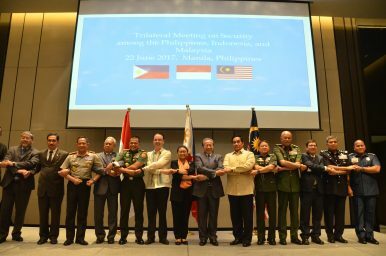 Last week, Indonesia, Malaysia, and the Philippines held a trilateral security meeting in Manila to discuss terrorism and extremism in the region. The engagement was the latest sign of emerging cooperation between the countries amid rising fears about Islamic State in Southeast Asia. As I have written previously, Southeast Asian states have long been aware of the reality that as the Islamic State faces setbacks in the Middle East, it could view other regions, including Southeast Asia, as new homes for recruits or alternative targets for attacks. A series of attacks in the region, beginning with Jakarta last January and then Kuala Lumpur in June, had helped reinforce that point even more clearly (See: “ASEAN’s Islamic State Conundrum“). Little surprise, then, that this heightened threat perception has further catalyzed already ongoing cooperation among regional states. This is particularly the case with respect to Indonesia, Malaysia, and the Philippines, which had already been gradually inching toward operationalizing trilateral patrols in the Sulu-Sulawesi Sea. The joint patrols were finally announced on June 19 after multiple delays (See: “Confronting Threats in the Sulu-Sulawesi Seas: Opportunities and Challenges“). As I noted in an piece earlier this month from the Shangri-La Dialogue (SLD), Asia’s premier defense dialogue, officials from the three countries had been signaling that the trilateral cooperation would not just be confined to the Sulu-Sulawesi Seas, but would also include wider cooperation on common challenges such as terrorism with an expansion bringing in other states including Singapore and Brunei (See: “Sulu Sea Trilateral Patrols in the Spotlight at 2017 Shangri-La Dialogue”). True to form, on June 22, diplomatic and security officials from all three countries met in Manila to discuss the terror threat. The initial genesis of the meeting, which was mulled weeks earlier but complicated by the dynamics of the Marawi crisis, was to learn more about the Philippines’ handling of the threat and its regional impact as well as to share data and intelligence about the terror threat. But the parties also discussed how to collectively forge cooperation against terrorism. In his remarks following the conference, Philippine Foreign Secretary Alan Peter Cayetano stressed that the countries had discussed a multipronged effort to address the root causes of extremism that included not just arms, but education and communication. In a joint statement following the closed door meeting, the three countries vowed to work on an action plan detailing joint counterterrorism approaches, including sharing intelligence, curbing illicit activities along their borders, stopping terrorism financing, and containing the spread of terrorism-related content in cyberspace. To outside observers, such language might seem boilerplate, and the collaboration quite basic. Yet getting on the same page about the nature of the terror threat and the approach to combating it is no easy feat. This is especially true for neighboring states that both differ in various ways — from the political systems they have to the weapons they operate — and have had disputes among them, which they continue to manage. And the reality is that in some cases, even basic forms of cooperation, including verification of numbers and incidents, are difficult to achieve due to a range of challenges. Consider the issue of the number of Islamic state fighters currently operating in the Philippines. Differences over this, which are not uncommon amongst Southeast Asian states, surfaced publicly at the SLD, to the surprise of many of the delegates present. The incident began when Indonesian Defense Minister Ryamizard Ryacudu revealed that the intelligence he had received had suggested that there were 1,200 Islamic State fighters in the Philippines, with around 40 of them being from Indonesia. In response, Philippine Undersecretary for Defense Policy Ricardo David, who was with Ryacudu on the same panel at the conference and was caught off guard, expressed shock at the number, saying that there were around 250 to 400 Islamic State fighters, with 40 foreign fighters present in total. Philippine defense officials continue to stand by that 40 number publicly, with most of these militants being Malaysians and Indonesians. Philippine military chief Eduardo Ano has also said that while only a portion of these foreign fighters are actually based in Marawi, and that most of the militants that had been monitored have already been killed, there is always the risk of more foreign fighters infiltrating the country if it is viewed as a “magnet” for other militants now abroad. But the bigger lesson here is not in the specific number, but the broader issue of the need for greater collaboration among these states and the sensitivities that can emerge if such cooperation is not forged. The three countries have agreed to hold another meeting soon, with Indonesia set to host in October. That meeting, along with other ASEAN-wide engagements that occur under the Philippines’ chairmanship of the regional grouping this year, could see these three countries move toward more concrete steps such as the inking of a joint action plan, and perhaps other measures in concert with their fellow Southeast Asian brethren. The two countries announced efforts to strengthen collaboration in this area during a security meeting this week. ASEAN's Islamic State ConundrumASEAN’s Post-Marawi Islamic State ChallengeWhy Has the Philippines’ Military Struggled in its Terror Fight Under Duterte?What's Next for the New ASEAN ‘Our Eyes’ Intelligence Initiative?What Did the New Asia Terrorism Meeting in Indonesia Achieve?